Any fuse (the common term for a fusible link) has the primary function of protecting a piece of electrical or electronic equipment. It is a sacrificial component, which though costing only pennies, protects components which may cost several thousand times as much. Auto fuses are no different to any other in this respect. The secondary function is one of safety. In the event of a short circuit, the fuse will blow and prevent the flow of high currents which could cause localised overheating with the risk of fire. Fuses will allow normal currents to flow but will permit excessively high currents to flow for only a very short time before it "blows". Fuses are made from a length of a low melting point alloy inside a protective casing to safeguard the surroundings if the fuse should "blow". The metal alloy has a resistance to the flow of current which causes it to heat up. The profile and length of the alloy strip depends upon the current for which the fuse is designed. If the current flowing exceeds the design value of the fuse, the temperature rises high enough for the alloy strip to melt and break the circuit, immediately stopping the flow of current. Fuses can be designed to be "slow-blow" or "fast-blow". "Slow-blow" fuses will allow a small overload for a short time period before blowing. This is useful for equipment such as motors which may draw a higher current for short periods such as when starting up. "Fast-blow" fuses will not tolerate such an overload and are typically used for more sensitive electronic equipment. When a fuse "blows", generally, the metal alloy strip vapourises and the fuse housing must be capable of containing the pressure generated. Fuse housings can be made from a number of different materials including ceramics, plastic and glass. The alloy strip within the housing may be surrounded by air, or non-combustible insulators such as silica (sand). The most efficient method of supplying power to a number of circuits in a car is to take the supply from the battery using a single high current capacity wire. At a convenient point, this is divided into smaller branches which are supplied by thinner gauge wires. In a car's original wiring loom, this is normally done at the fuse box, a fuse of the appropriate value being used for each circuit supplied. This means that in the event of a short circuit or an overload in any one circuit, only the fuse for that circuit blows, ensuring all other circuits have continuity of power supply. This is known as "Coordination". When wiring your carputer, logic dictates that if you have the spare capacity at the fuse box, you should take your supply from there and ensure you protect the circuit with an appropriate fuse. 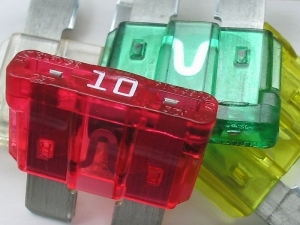 The most popular auto fuses you will see on modern cars are the blade type fuses shown on the left. There are four main types of blade auto fuses as shown in the illustration below. These are the MAXI FUSE, the ATO FUSE, the MINI FUSE and the LOW PROFILE MINI FUSE. The values in which these are available, and the color codes used are shown in the table. This image is licensed under the Creative Commons Attribution ShareAlike 3.0 License. HOWEVER to minimise the possibility of audio interference and to give as "clean" a supply as possible, I recommend you run both positive and negative wires directly from the battery to the carputer. If you do this, it is essential you fit an inline fuse to the positive wire, no more than 400mm away from the battery terminal. You should use the principle of coordination explained above to fit additional fuses if the power cable branches to supply different circuits, e.g. your display screen. 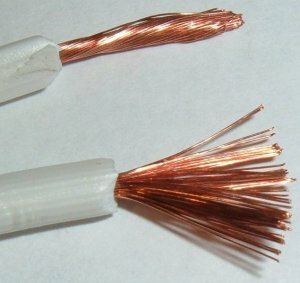 Carputer Wiring - get help with cable selection.